I was a grad student at Penn State at just the right time. The literary scholar Aldon Nielsen was going through this process of converting his expansive vinyl collection to digital files. So if you were around and asked him about a musician or poet, and he happened to have just converted their works, he'd make you a CD. Seriously. You'd ask him about some early Amiri Baraka recording or some obscure jazz album, and a day or so later, there in your mailbox would be the CD. Free. Along with a photocopy of the album cover and liner notes. At some point during those days, Professor Nielsen and I were having a conversation about my research and writing on black arts poetry, and I started talking about Cortez. She apparently recorded albums, I told him, but our library doesn't have any. "Really? They don't?" he asked. 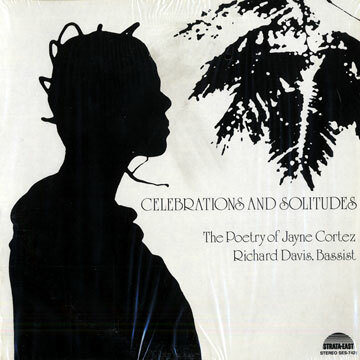 When I checked my mailbox the next day, there was a copy of Celebrations & Solitudes (1974), an album featuring Cortez reading her poetry to the accompaniment of jazz bassist Richard Davis. Their performance of "I am New York City" is my favorite from that album. For nearly a decade now, I've played it nearly every semester in class or at our public humanities events for black studies every semester. At this point, Cortez is integral to my personal and classroom canon. Professor Nielsen's generosity with his collection is responsible for getting her there. Jayne Cortez "Find Your Own Voice"